Frank Marocco was a giant. Not only for his mastery of the instrument itself, but for his highly developed musicality. In any style, on the concert stage or in the recording studio, his playing was technically brilliant and musically superb. 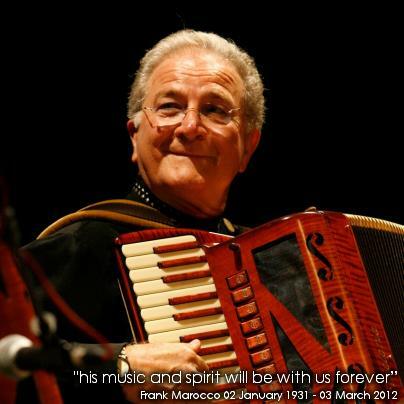 Frank Marocco is one of the most recorded accordionist in America (and, possibly, the world), having played on a vast number of movie soundtracks, television scores, commercial jingles and record albums, in the studios of Hollywood and beyond. He has recorded for and/or worked with artists ranging from Brian Wilson, Pink Floyd and Madonna to Luciano Pavarotti, conductor Maxim Shostakovich and composer John Williams. He was nominated eight years in a row for the Most Valuable Player Award by the National Academy of Recording Arts and Sciences (N.A.R.A.S) and received that award twice. Frank was also a consummate jazz artist and a gifted composer with several of his own albums to his credit. He has played his music for audiences all over the world.